Sleep Apnea Mask, BUY Hybrid CPAP Mask, Universal Interface, HYB530, RespCare. Hybrid CPAP Dual Airway Interface is an advanced Sleep Apnea Universal Interface designed for Respiratory Therapy of CPAP patients. The universal design of the Hybrid CPAP Dual Airway Interface delivers air to both the nose and mouth without the typical discomforts of full face masks The Hybrid CPAP Interface reduces the effects of nasal bridge sores, air leaks near the eyes, and claustrophobic feelings that are common with other CPAP Masks. 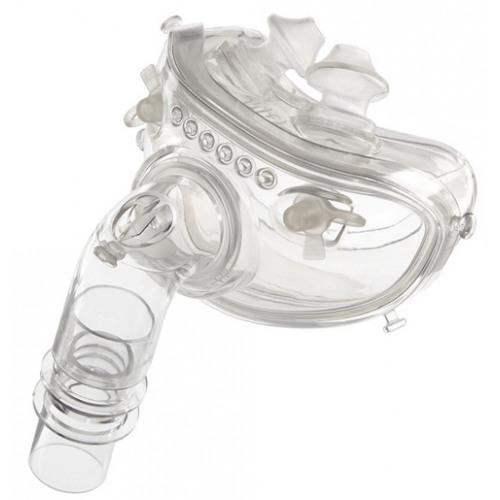 This CPAP Mask serves as a nasal interface, an oral interface, and a combination of the two. 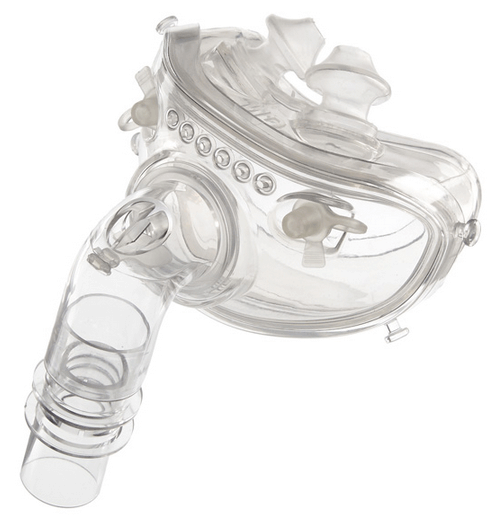 The Hybrid is a dual airway interface for use with positive pressure ventilation devices for the treatment of respiratory insufficiencies and obstructive sleep apnea. The unique design of the Hybrid promotes patient comfort by eliminating pressure points on the forehead and across the bridge of the nose. A built-in chin flap gently supports the chin ensuring optimal performance. With its ultra compact design, the Hybrid is half the size of traditional Full Face Masks. The Hybrid CPAP Dual Airway Interface is a complete system containing all of the components required to properly size the CPAP patient, eliminating the need to open multiple packages to get the right fit. Click here for Hybrid Dual Airway Interface Sizing Chart. Ultra compact design offers clear line of sight with no forehead contact. Double membrane cushion optimizes sealing and comfort. Built-in chin flap gently supports the chin, eliminating the need for a chin strap. Nasal pillows can be adjusted to either a ?TALL? or ?SHORT? position to allow for a further customized fit. Comes in an All Sizes Kit (which includes 3 Pillows sizes and 3 Cushion sizes), where all 3 cushion sizes can fit the single mask shell. RespCare Hybrid Universal CPAP Interface Product Number: HYB530. Application: CPAP Dual Airway Interface - Oral Interface for Sleep Apnea and Nasal Interface for Sleep Apnea. Sizing: Complete Interface System Designed for Universal Fitting. Replacement Cushion Sizes: Small, Medium and Large. HCPCS codes (masks): A7027 and A7035. HCPCS code (replacement cushions): A7028 and A7029. Is the headgear included with this product? Mask is very comfortable and I love that I can still wear my glasses after I put it on and read. The only problem I have is if my nose gets moist the nose cushion slips out and wakes me up. I have a very high air pressure so that may contribute to this problem but it's worth a try if you don't like anything on the bridge of your nose or forehead.